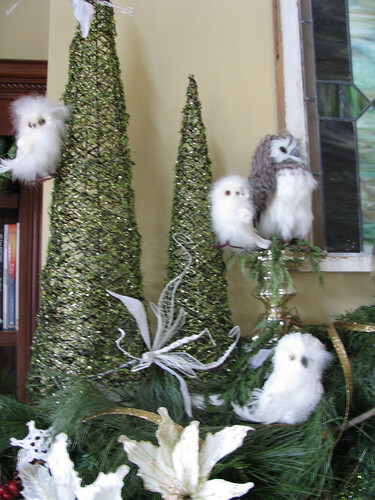 So the following are many (not all) of the trees I have throughout the house. 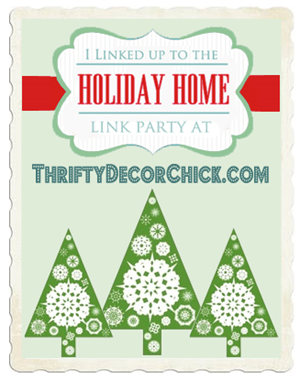 I always say from year to year that I am not going to do as much..but I cannot seem to live up to that promise. 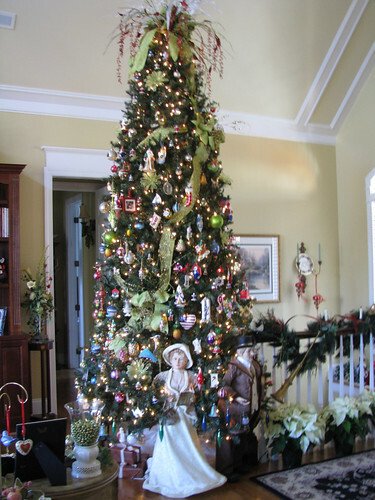 The Great Room Tree…It is 12 foot and we had to place the lower branches into the ballaters so that it would fit in the area..the lower branches hang over the stair well and you can see the ornaments dangle. 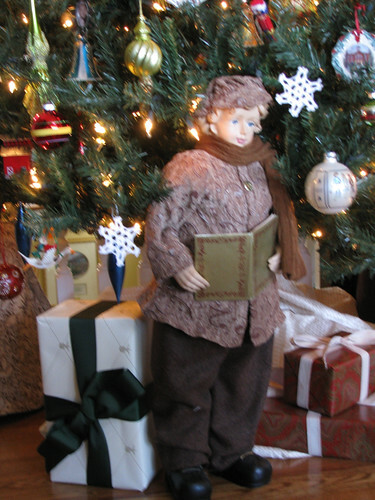 I placed my carolers around the tree as if they are singing around a tree in a town square. 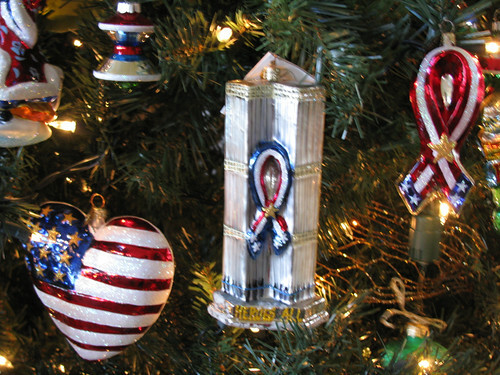 Among my more sentimental ornaments, I love to use Christopher Radko ornaments. 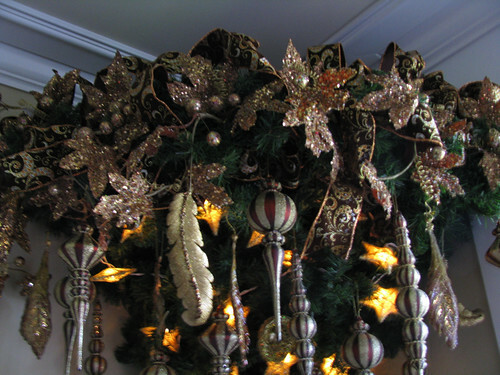 I add a garland of ribbon, usually two (a metallic over a flocked) that will connect to a large bow and various ornamental picks. 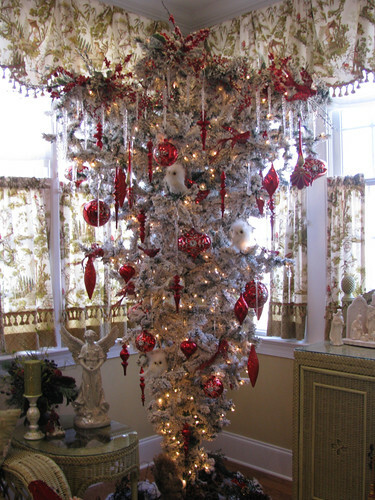 My upside down tree in the sun room. 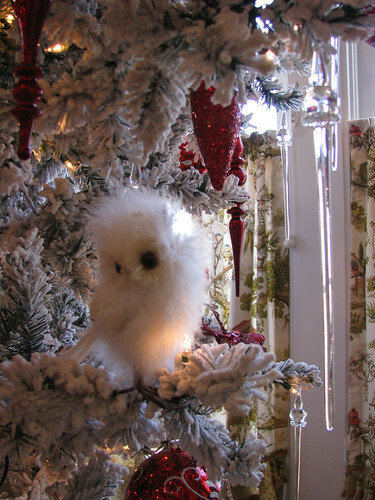 It is flocked and I used red ornaments with glass crystal icicle ornaments. 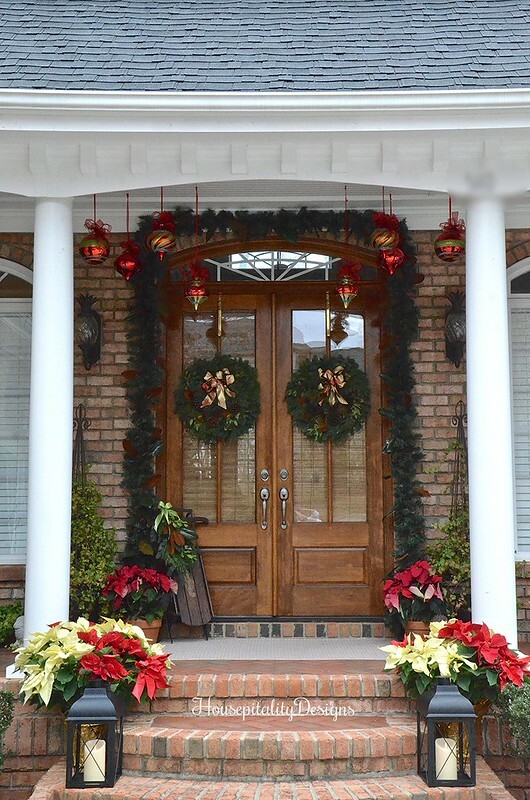 The red shows up so nicely against the white flocking. 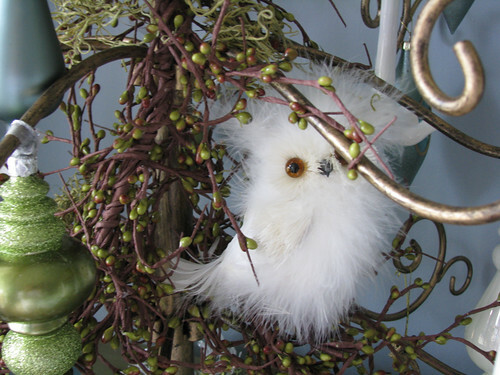 Owls are perfect for that woodland look. 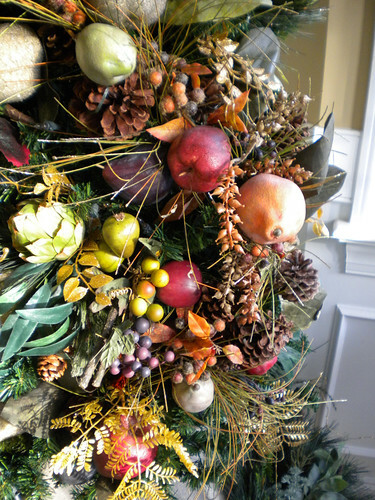 I place berry floral picks and garland at the front top edge. 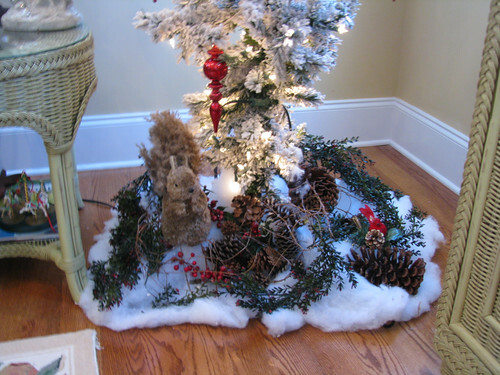 The base of the tree with pine cones, holly sprigs and a “visitor” the infamous furry squirrel. 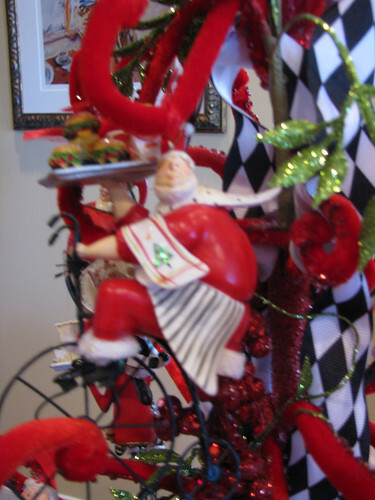 The kitchen tree with Santa take out chefs. 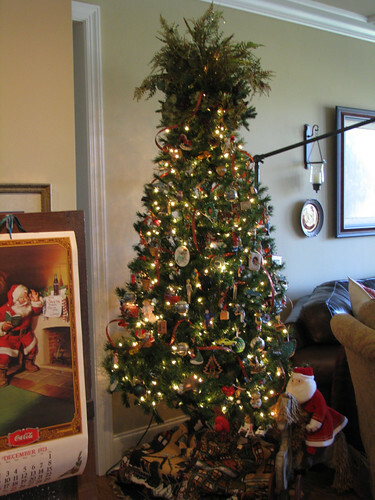 This has been there for the past few years, so I will change that around a bit next year. 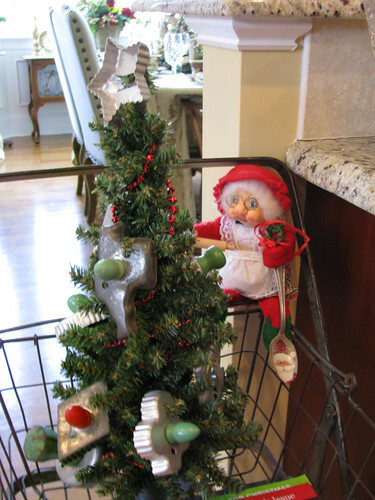 The small vintage cookie cutter tree that sits in an old A&P grocery shopping cart. 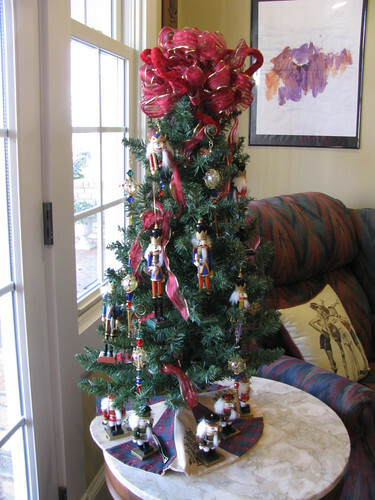 The media room tree decorated with Hallmark ornaments and a few handmade ones by my son many years ago.. 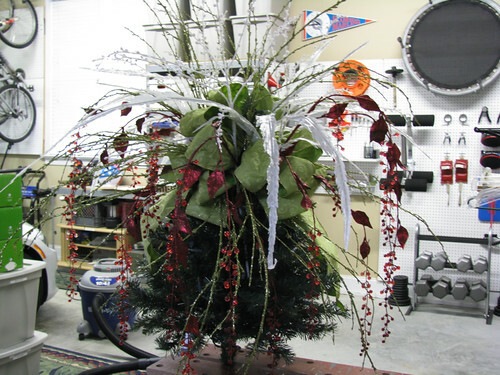 The topper…with silk ferns and hydrangeas. 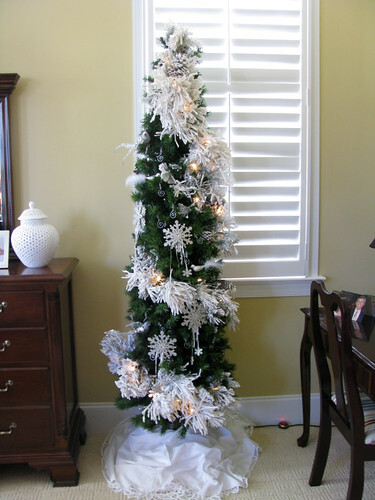 I used a metallic glittered garland band that twists nicely amid the tree. 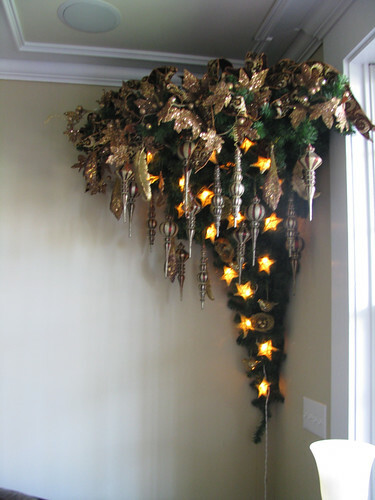 The corner wall mounted upside down tree…I used brown and copper ornaments to coordinate with the mantle. 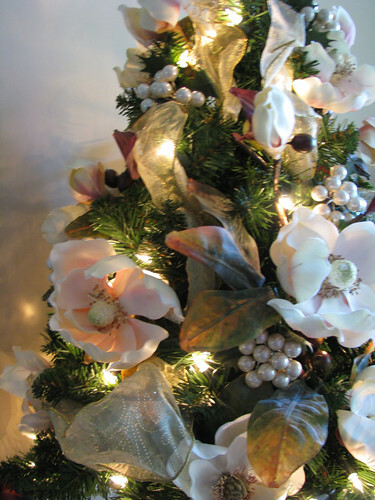 Floral and leaf inspired picks are inserted on the top portion of the tree. 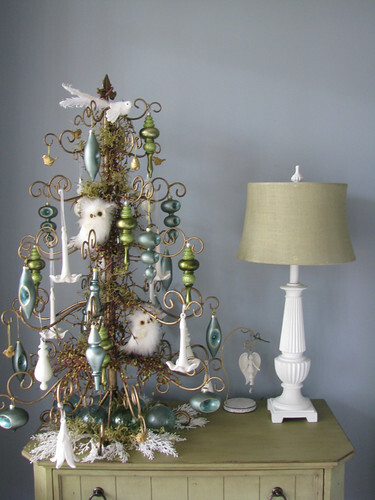 When decorating the top portion of the 12 foot tree, I place (actually my hubby does) it in a bench with a vice so that I can decorate it completely from the workbench. 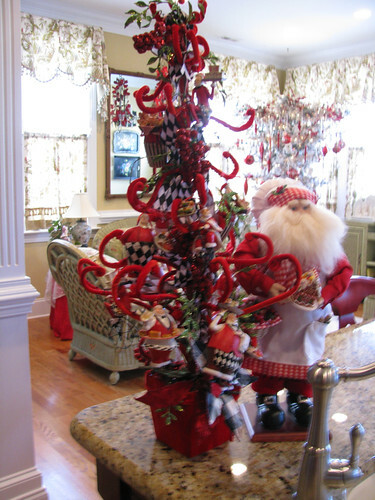 The hubby climbs up the ladder and places the top portion in the tree fully decorated. Saves me from being up on the very top of the ladder! 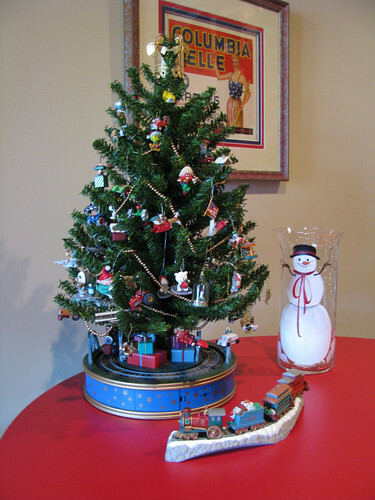 A Hallmark miniature tree purchased many years ago and a train goes around the base of the tree…a favorite of my granddaughters. 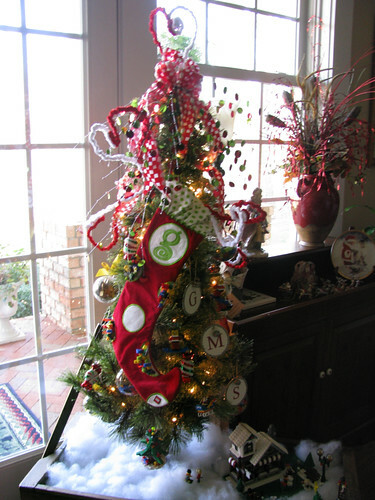 My granddaughter’s tree. 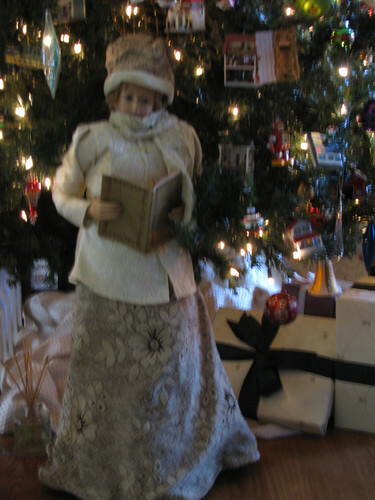 It is a themed tree every year of her choice. 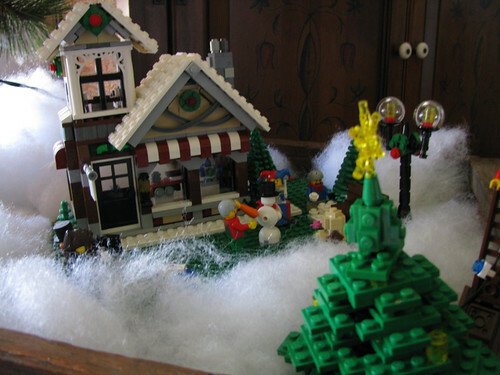 This year it is Legos..
An old Dept 56 faux “feather tree” with white and gold acorns. 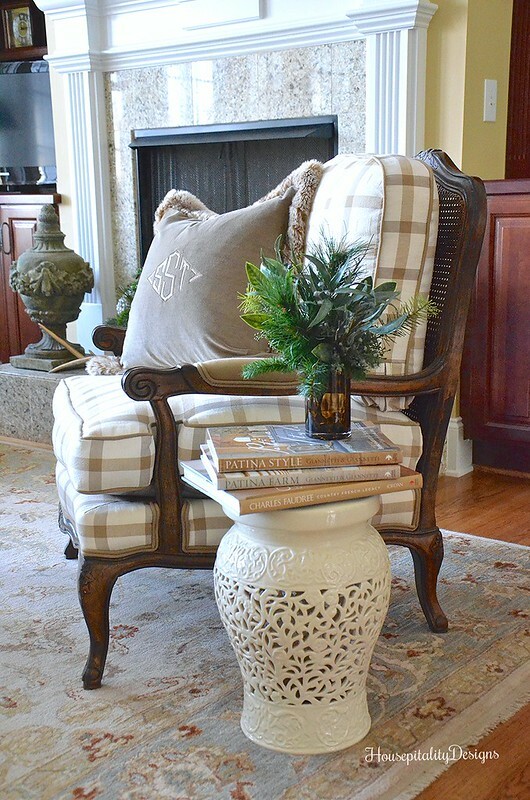 A symbol of Raleigh, the City of Oaks. 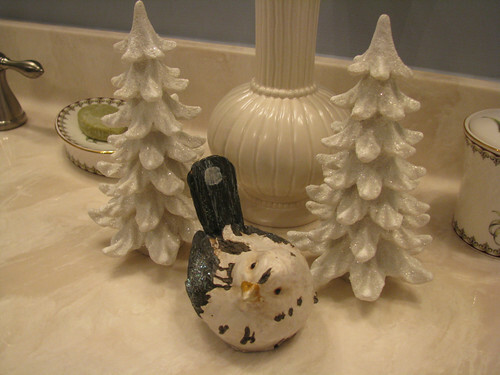 Sits on the dresser of the guest room. 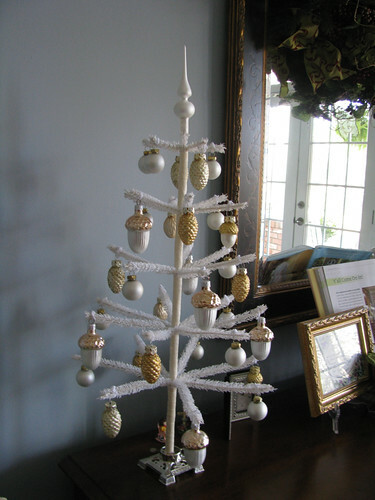 The tree in the Master Bedroom. 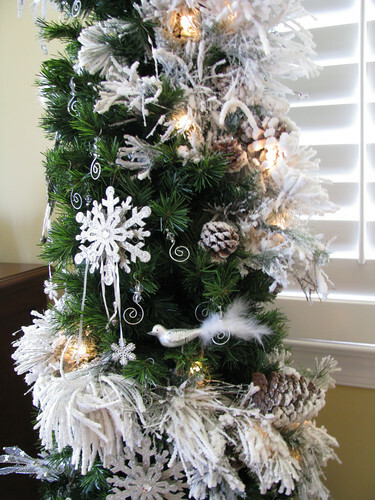 I wrapped a lighted white flocked garland around it and placed silver ornaments and decorations on it. 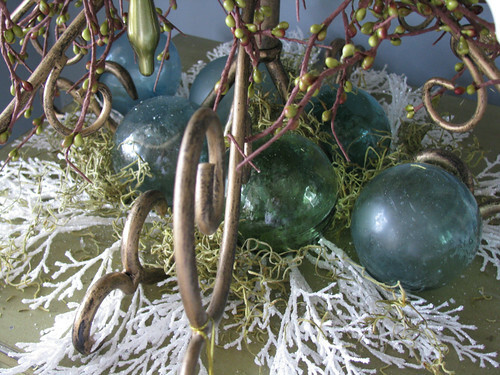 A close up..I also used up all the silver ornament hangers I had. I thought they were cute by themselves. 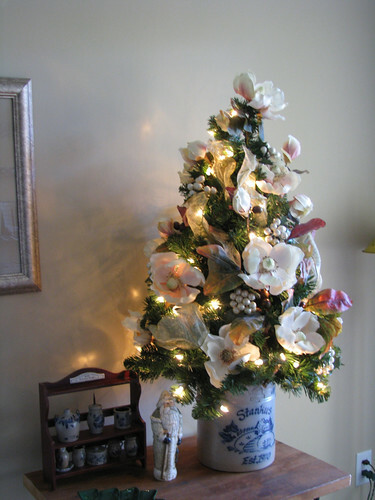 A magnolia and pearl tree in the other guest room. 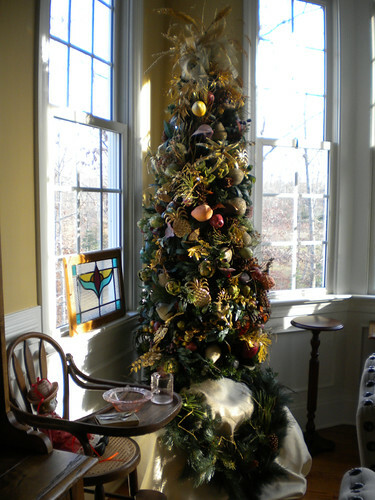 The dining room tree. 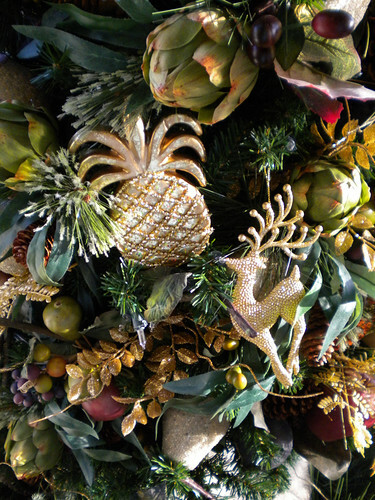 Decorated with various fruits, fruit garland, and pineapples. 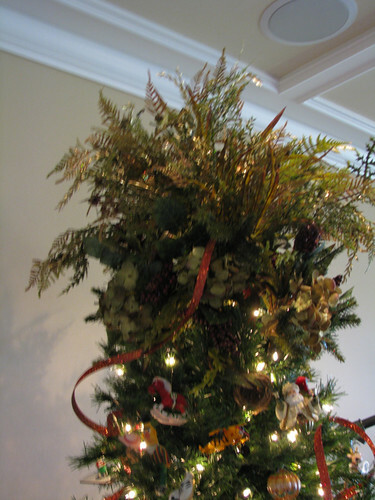 It is raised off the floor and I placed an evergreen garland at the base. 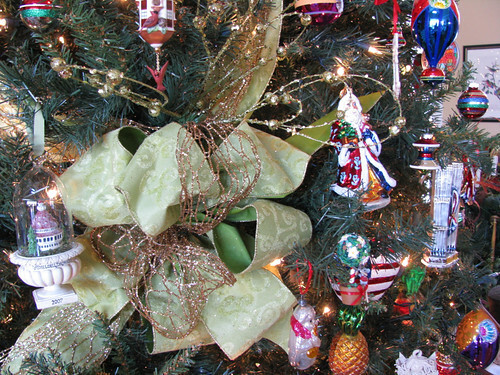 Another close up view of the dining room tree. 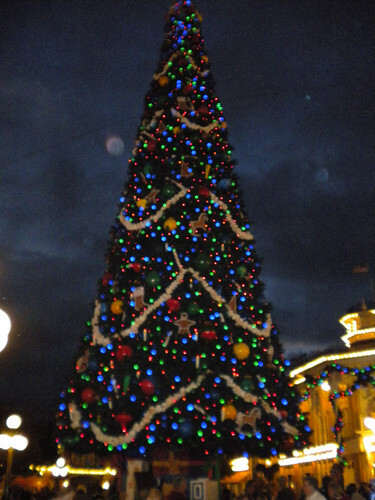 And finally, one of the greatest trees of all..the tree on Main Street at Disney World. You can see some of the “snow” that they spray through the air in the evening. It was a beautiful enchanting night.